Outer clutch cover gasket made of Kevlar fiber-blend gasket material Sold each Replacement for OEM 3SP-15463-11-00 Fits the following Yamaha models: YZ250WR 1992-1994 YZ250 1995-1996, 1998 Please Note: The image displayed is representative only, the actual amount & types of gaskets and seals included in each kit is dependent on your specific application and may vary significantly from image. Do not order from image alone. Outer clutch cover gasket made of Kevlar fiber-blend gasket material Sold each Replacement for OEM 4JY-15463-00 Please Note: The image displayed is representative only, the actual amount & types of gaskets and seals included in each kit is dependent on your specific application and may vary significantly from image. Do not order from image alone. Outer clutch cover gasket made of Kevlar fiber-blend gasket material Sold each Please Note: The image displayed is representative only, the actual amount & types of gaskets and seals included in each kit is dependent on your specific application and may vary significantly from image. Do not order from image alone. 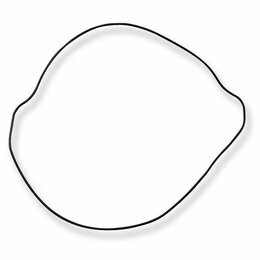 Outer clutch cover gasket made of Kevlar fiber-blend gasket material Sold each Fits the following Honda models: CR80R 1992-2002 CR80RB EXPERT 1996-2002 CR85R 2003-2007 Please Note: The image displayed is representative only, the actual amount & types of gaskets and seals included in each kit is dependent on your specific application and may vary significantly from image. Do not order from image alone. Outer clutch cover gasket made of Kevlar fiber-blend gasket material Sold each Replacement for OEM 11484-37E00 Please Note: The image displayed is representative only, the actual amount & types of gaskets and seals included in each kit is dependent on your specific application and may vary significantly from image. Do not order from image alone.